Whether it is adventure or romance your stay at the 'Hideaway' will refresh your soul. 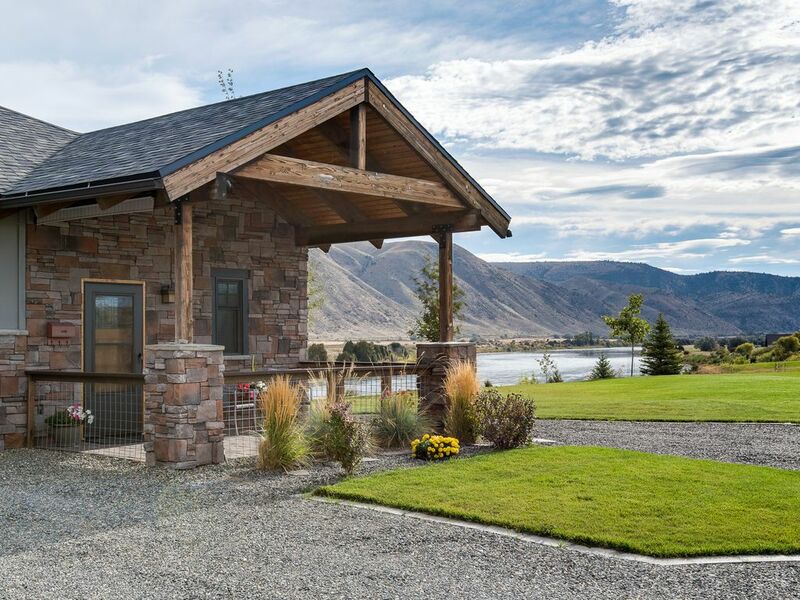 Located on the Missouri River, this quiet vacation rental, with over 300 ft. of river frontage, is the perfect location for that special getaway. After preparing a romantic dinner in your kitchen you can relax on your private deck with your loved one while you enjoy the wild life, summer sunset or the moon glistening on the river. What could be sweeter than a blazing fire in the fire gazing and eating S'mores. If you prefer to stay indoors you can enjoy sitting or reading by your cozy fireplace. End your evening with a salt bath in the jetted tub and then climb into a very luxurious king size bed with your choice of down or synthetic pillows for a restful night sleep. The next morning while you are getting ready for your day you can watch the sun come up over the mountains. The Missouri River is abundant with brown and rainbow trout. You may also catch some walleye. The fall hunting is among the best and the peaceful winter scenery makes ice-fishing and skiing a very enjoyable experience . For all of you skiing enthusiasts, we are just 68 miles from Bridger Bowl, 91 miles from Big Sky, 102 miles from Showdown located in Neihart and the Great Divide in Helena is 68 miles. If you prefer, we are also near caverns, historic towns and hot springs. Lewis & Clark Caverns 36 miles, West Yellowstone 137 miles, Virginia City (open seasonally) 80 miles, Norris Hot Springs 50 miles, Boulder Hot Springs 65 miles, White Sulphur Springs 70 miles (our personal favorite) and Bozeman Hot Springs 50 miles. If your day is filled with fishing, rafting, skiing or just relaxing with a good book, you will be comforted knowing that your luxurious romantic retreat is waiting for you! 1.Robes are provided during your stay. 2.Slippers are available on request. 4.Choice of Red or white wine,sparkling cider or local craft beer & something sweet upon arrival. 5.Your choice of feather/down pillows or synthetic. 7. For your evening enjoyment~ your own private fire pit. 11. WiFi is no longer available since most of our guests now have a smart phone or tablet with a data package. We are located a short 40 minute drive from Bozeman! Fall/Winter rate $150 a night with a 2 night minimum stay or $700 a week. Each subsequent night is $150 per night up to the 8 night maximum stay. Spring/Summer rate $150 a night with a 3 night minimum stay or $850 a week. Each subsequent night is $150 per night up to the 8 night maximum stay. **Please note** The carriage house is attached our garage which separates the Hideaway from our personal residence. We DO NOT share a common wall. Bill & I built this very special carriage house vacation rental with YOU in mind. Based on over 37years in the travel industry we created, what we believe, to be a very relaxing, private, serene, comfortable and tranquil getaway. You will love it here! Our carriage house caters to a romantic getaway. Most of our guests visit us for a special occasion eg: Anniversaries, engagements, birthdays, honeymooners and couples that are just reconnecting. We are rural and away from it all on the Missouri river. We welcome small weddings, vow renewals and elopements. Comfortable size bath with a separate shower and jetted tub. You will find complimentary shampoo, conditioner, lotion, shower gel and bath salts. We are centrally located between Bozeman & Helena on the Missouri river giving you so many options for your vacation. We NO longer have internet service as most of our guests have a smart phone and/or tablet with a data package. Our cellular service is excellent. Assortment of books for your enjoyment during your stay. Approximately 1 acre of lawn and fire-pit area. Canoeing is very popular on the river...especially during the spring and early summer months. Your own private back deck with table, 2 chairs & bench overlooking the river. We have recently added another small private deck with stairs to the river. nearest golf course is located just 17 miles away. Romantic get away also includes robes & slippers (on request). OUR WEEK is 6nights/7 days Fall/Winter rate $100 per night 2 night minimum $500 week 7 nights = $650 8 nights = $800 Spring/Summer rate $150 per night 3 night minimum $700 week 7 nights = $850 8 nights = $950 Christmas Week/New Year's rate $150 per night 3 night minimum Cleaning Fee $75 Bed Tax = 7% WiFi is no longer available as most of our guests have a smart phone or tablet with a data package. ***The 'Hideaway' is equipped with radiant floor heat. IF YOU FOUND US ON THE PARSONAGE WEBSITE PLEASE CONTACT US DIRECTLY FOR RATES! ***The "Hideaway" AKA Carriage house is attached to our garage. We DO NOT share a common wall to ensure our guests have a quiet private retreat. From the first sunset to the last sunrise, my husband and I shared an unforgettable 10 days. The Hideaway gave us picturesque views, extreme comfort and lifetime memories. We absolutely LOVED it. Ellie and Bill were the best. Such gracious hosts that felt like old friends. They have truly designed a masterpiece with the Hideaway! Can't wait to go back. The pictures simply don’t do it justice! Ellie and Bill were wonderful hosts! The unit was so nicely finished and completely stocked for our every need. Including a welcome basket of local beers, snacks, coffee and tea. The view from the unit is amazing! Perfect to relax on the deck and watch the river run past. We enjoyed every minute of our stay! Thanks again! My husband and I went here on our honeymoon and it was so wonderful!! Beautiful scenery, clean, and very homey. We didn't want to leave! Thank you! We were thrilled that you and your husband chose to begin your marriage at the "Hideaway!" Hope to have you back sometime! Wow! Clean, smells wonderful, design is high end and very well appointed. We are very picking guests... and this vacation rental was gorgeous and the view was even better! We feared it would be a long drive into Bozeman and Townsend but it only took about 35-40 minutes to get to Bozeman and 15 to get to Townsend. It was relaxing under the brilliant stars with a fire pit burning and during our stay we heard and saw a broad range of wildlife and birds... the flowing river right out front was so soothing. We highly recommend this for a break from everything... especially for a couple. The hosts we so welcoming... they went above and beyond as compared to other rentals we have stayed in. This is a memorable spot in this beautiful state. It's all that and more!! The photos of this rental are exactly what you find - and then you experience "more"... every detail is well thought out for style and comfort! From the welcome basket goodies, water and candy at bedside, and relaxing/restful color scheme and decor. The property is gorgeous, inside and out pristine and very well-maintained. Owners, Ellie and Bill, are gracious and friendly. This week was the perfect break needed to sit on the deck enjoying the river and views - we could not have asked for more! We are located on the Missouri River between Bozeman and Helena in a very quiet,serene & rural location. Bozeman Gallatin airport is located just 43 miles away, Helena regional airport is 45 miles and Butte is only 64 miles. Other Activities: We spent last summer exploring Yellowstone National Park, touring the Lewis & Clark caverns, floating/fishing the river, riding the tour train in Helena, MT, shopping in Ennis, MT, hiking the mountains in the area and soaking in some of the best hot springs around. And our favorite was trying out some of the best little unknown restaurants within an easy drive of the Hideaway. Some of our favorite's are: Pompey's Grill, Sacajawea Bar, Willow Creek Restaurant and LaHood Park Cafe. Golf: Our nearest Golf course is just 20 miles away in a quaint Montana town of Three Forks. Ski: We prefer skiing the local mountains such as the Great Divide~Helena, Showdown~Niehart, Discovery~Anaconda and Bridger~Bozeman. If you prefer a more resort style skiing experience Big Sky Ski & Resort is just an hour and half drive!